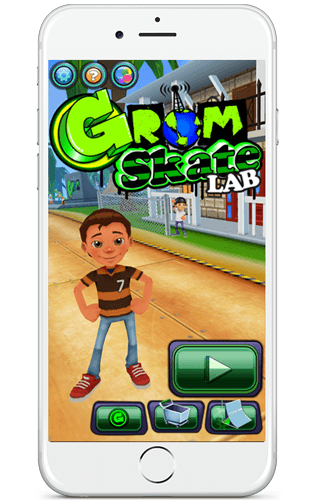 GromSkate is a fast paced skateboarding adventure through the planets of the Gromarama5 Solar System! Race through courses, dodging obstacles, traffic, and other skaters while you collect coins and do tricks. Additionally, GromSkate covers 4th to 8th grade Common Core Math Standards. Players solve puzzle challenges related to angles and triangles in the Skate Lab to create and receive a new ramp. These ramps let you do awesome tricks and multiply your coins you collect. Learn more about Grom Skate by visiting the offical website or iTunes store.